In 1988, I was 23, a year out of film school, fresh from my first job on a feature film and, with one day off in between, about to start work on a second feature. The film was Paramount Pictures’ adaptation of Stephen King’s bestseller Pet Sematary, and working on the production had a profound effect on me as a filmmaker. I was coming off a low-budget indie where I was once on-set for 45 hours straight, working in a new department every day and doing everything from washing the producer’s car to stepping in as an assistant camera operator. The experience of going from a $1,500,000 indie to a $20,000,000 studio feature was a dramatic study in contrasts that left a mark on my filmmaking psyche. I do not know how old John Campopiano or Justin White were in 1988 but I suspect that they are considerably younger than me. Both guys saw Pet Sematary numerous times as kids and continued to be captivated as adults. To say that the movie had a profound effect on them as filmmakers is an understatement — they became filmmakers because of it. Their first film is a “making of” documentary about Pet Sematary that is unlike any other film in the genre. It is not merely a look behind the scenes of the nuts and bolts of the production; it is an exploration of others affected: the residents of the Maine towns where the film was shot, as well as the people who worked before and behind the cameras. From what I can tell, the process of making the documentary began with John going to the IMDb page for Pet Sematary and making contact with as many of the people listed in the credits as possible. One of those people was me and, while being the set construction department production assistant might not have been the most exciting job on a film crew, I was thrilled to share my recollection as well as the many photographs that I shot while on-set. JOHN CAMPOPIANO: I’m originally from Rhode Island but now live in Boston, MA. I got my bachelors degree in Ethnomusicology at Wheaton College in Norton, MA. The last four years I’ve been working at New England Conservatory of Music in Boston, and I’m a Masters student at Simmons College where I’m studying archives management with a special focus on moving image and sound archives. JUSTIN WHITE: I’m from Rhode Island. I went to New England Institute of Technology and majored in Video and Radio production. I worked for various local radio stations doing production work and have been employed at WPRI TV in Providence for the last 9 years as a camera operator and video editor. DAVID GREENBERG: Discuss your relationship with Pet Sematary, when you first saw it, how many times you have seen it, what always jumps out at you about it, why you like it. JC: I have vivid memories of seeing Pet Sematary for the first time. I was five or six, sitting on the top bunk of my friend’s bunk bed, when we popped in a VHS rental copy of the film. Being so young, I was unable to really absorb many of the themes in the film; however, I picked up on its many horrific visual elements, particularly Zelda. It’s actually rather funny because in reality I missed a good 20-minute chunk of the film due to burying my face in a pillow after seeing Zelda for the first time. She terrified me. My introduction to Pet Sematary will always be entwined with Zelda’s performance. 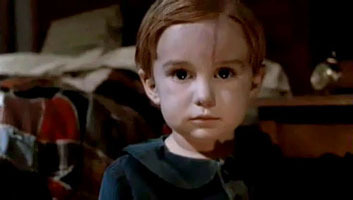 JW: I remember Pet Sematary being on TV a lot when I was a teenager. I of course knew of Fred Gwynne and really liked the other movies I’d seen him star in. I think I watched it the first time just out of curiosity to see what kind of role Fred had, and being a horror fan ended up loving the movie from that point on. There were a lot of things about Pet Sematary that got me into it when I was younger, too many to list, but what stands out to me now is the fact that it really reaches you on a level that goes way beyond typical horror movie shock and suspense. Pet Sematary’s effectiveness at least for me is derived from reaching our deepest fears and after 25 years I still can’t get used to it. DG: What made you decide to make a documentary about the behind the scenes of the film? JC: Truthfully, because it hadn’t been done before. The 2006 Collectors Edition DVD has some nice featurettes, but as two diehard fans of the film, it left something to be desired. We wanted to create something that WE would want to see as fans ourselves. For me personally I’ve always been devoted to the horror genre. As a kid, I spent my money on horror movies, I snuck into horror movies at the theater, and secretly I always wanted to be in a horror movie. So, for me this project is particularly personal because I feel as though it’s my opportunity to give something back to the horror community that I care so much about. I’ve alluded to this in the past, but I can’t stress enough how organically this documentary has evolved. Our original sights were not set on making a feature-length documentary on the making of the film. As we uncovered more media coverage, more behind-the-scenes photographs and footage, and the more amazing people with unbelievable stories, we knew we had something special on our hands. As I said, this documentary is something that we as fans of Pet Sematary ourselves would want to see. Hopefully other fans will feel the same. JW: After visiting some of the shooting locations a few years ago and meeting some of the locals who had very interesting stories about Hollywood setting up shop in their backyards, we realized there was a unique opportunity there to share these experiences with other Pet Sematary fans. DG: Your film is not a typical “making of” documentary because you not only talk about the production of the film, you talk about the impact it had on the people in the communities where it was shot. How did you get the idea for this approach to the film? JC: For the most part it all started with our first trip to the Bangor area. Maine is a very special place. So much of it is still wild and untouched. As we began talking with locals (both during our trip and after returning home) we realized that many of them had personal stories from the production. In many cases, they had photographs and footage that have sat in basements or attics since ’88. Both Justin and I went into this thing already being fans of everything and anything New England. Compounded with our love of the horror genre, approaching a documentary of this felt very natural. JW: We, as fans, were fascinated by what we were hearing and learning about the experiences the locals had with the production. We wanted our project to differentiate itself from other “making ofs” by spotlighting not only the cast and crew, but also incorporating the local ‘voice’ in order to tell the full story of a production that was shot on location. DG: You have had to track down and contact not only people who worked on the film but people from Maine who live in the areas where it was shot. What has the production process been like? JC: We’ve sent out thousands of emails, made hundreds of calls, sent hundreds of physical letters, and spent countless hours tracking down everyone who had a part in the film – from the director to the local hires who lent a helping hand. This process has been extremely intense, time consuming, and yet highly rewarding. The fact that this production was, compared with other Hollywood films, relatively small, the list of people to find has been somewhat manageable. A while back we managed to get our hands on call sheets and original cast & crew lists, which proved to be an enormous help. There are so many people who worked on Pet Sematary that are not listed on IMDB and other film databases. JW: Tracking down those who were involved with the production at times is really hit or miss. Since the film was made 25 years ago it’s pretty surprising we’ve found as many people as we have. Generally people that we have been successful in finding have also aided us in finding others by suggesting names and what they think they’re doing now. It’s been a tough process but a very rewarding one. DG: As a fan of the film, has anything that you learned come as a surprise to you? JC: There have been a lot of surprises along the way thus far. One surprise has been seeing just how ingrained Stephen King is in Maine culture and even modern day lore. For those of us who live outside Maine and who cherish King’s work, he possesses an almost mythical-like status. They don’t get much bigger than Stephen King. For those in Maine, he’s “Steve.” That’s not to say that they don’t find him special – they most certainly do. But he’s just another Mainer – another guy buying his coffee at the Cumberland Farms on the corner. I’m not sure that Justin and I have still managed to fully grasp or understand this idea. JW: It seems like with every person we talk to we learn at least one thing, sometimes many things about the film that truly amaze us. We’re very excited to be working on something that will allow other fans to learn them as well. DG: Since starting work on the film, have you sat down and watched Pet Sematary? Do you think you will see it from a whole new perspective? Will watching it again have a negative or positive impact on your feelings about the film? JC: Yes, I’ve watched the film since starting this project. It’s interesting because I feel more connected to it now that we’ve been to all of the filming locations, gotten to know many of the actors and actresses, and heard the stories of how it all came together. Justin and I are both filming location junkies – I will sit and watch a filming locations video of a film I don’t even like. For me, connecting to a film that way is really special. I think fellow movie fanatics, particularly horror fans, know where I’m coming from. So, from this perspective I think being apart of this documentary makes seeing the film now all the more special and interesting. JW: I haven’t sat down and watched it all the way through since this process has started, due to a very busy schedule, but I do watch parts of it quite often in working on this project. I can’t express how much more fun it is to see it now after all we’ve experienced and learned. It’s like a whole new movie that you know by heart. DG: What do you want viewers — fans of the film, people from the Maine communities, people like me who worked on the film — to take away from watching your documentary? JC: I’m not sure if there are any “takeaways.” At the end of the day, we’re just hoping to make something interesting and fun for fans of the book and film to see. Fans are going to see images they never thought they would see, footage they never could have dreamed still exists, and interviews with those they probably never thought they would hear from. For example, we were lucky enough to get an interview with the woman who started the real “Pets Sematary” in Maine back in the 1970s – the cemetery King stumbled on one night and ended up writing his book about. After it’s all said and done, we’re trying to see that there are no stones left unturned. We’re going all out. JW: I hope whoever sees the documentary will come away with a new understanding and appreciation for the efforts and talents of the many individuals who worked around the clock and sometimes under very dangerous conditions to bring Stephen King’s best selling novel to the screen. Also we hope to keep the flame of Pet Sematary burning bright so that future generations can see how Hollywood with the help of residents of northern Maine produced one of the most memorable horror classics ever. DG: Have you heard the rumors about a re-make? If so, any thoughts? JC: We’ve definitely heard all of the rumors about a remake. It’s hard to say what my thoughts are on that. Like most people, my initial reaction tends to be, “Why mess with it?” It’s no secret that today remakes are certainly the thing to do. While I tend to be uniformly against them, I have to admit that there may be some interesting possibilities if a remake actually comes to fruition. King’s novels are often so extensive, long, and full of rich detail, that fitting it all into a 90-minute film is impossible. If different elements from the original story are explored I think I could get behind a remake. It could be interesting to see Norma Crandall, whose character (and subsequent events surrounding her character such as her heart attack and eventual death) played an important role in Jud’s decision to introduce Louis to the Micmac site in the first place. That said, something that made the original Pet Sematary so special was that King wrote not only the novel but also the screenplay. A subsequent lack of King in a future remake could prove to really hurt it. Sometimes, the original is better. JW: My take on re-makes in general is no matter if they’re liked or not by fans, they seem to inadvertently draw attention to the original. So if there is truth to the rumors of a remake I just hope it serves to sustain the interest that has been there all along with the fans of the story of Pet Sematary. Fascinating read. John contacted me a while back because I’d covered Pet Sematary for Fangoria magazine. That I also happen to be a Maine resident was icing on the cake! I visited the Pet Sematary set twice: once when they were filming in Mount Hope Cemetery in Bangor (when Louis is about to dig up Gage) and the second in Ellsworth, where they were shooting interiors inside a St. Johnsbury Trucking warehouse. Both were great experiences for me, and I had a pretty free hand on the set. That opportunity led to my covering several King films made here in Maine, including Graveyard Shift and Thinner. Can’t wait to see this documentary! It’s really a unique piece of work, and these two guys are totally devoted to the project. Kudos to them!